Pearl - Post-traumatic stress disorder, PTSD, is a debilitating psychiatric illness that often occurs after someone's experienced a dangerous or threatening event and people with PTSD tend to overreact to unexpected reminders of the events and are often hyper-vigilant for danger. 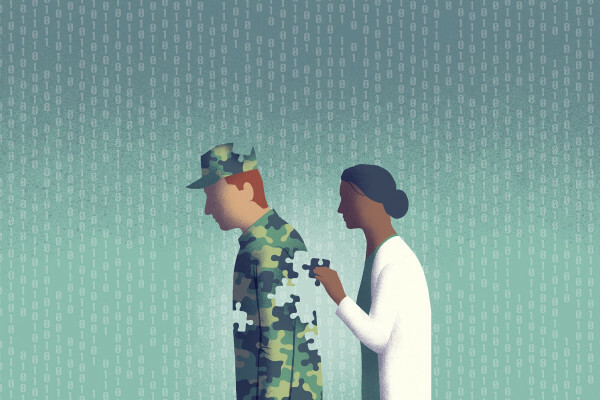 And so what we've done here is take new findings, from computational neuroscience, from computer science, from statistics, to try to fit models to understand what might be happening in PTSD. Chris - So in essence which bits of the brain are miswiring or misfiring in order to provoke the changes in behaviour you see in someone who's manifesting PTSD? Pearl - Yeah that's exactly right. Chris - And Brooks, how did you actually do that? Chris - So, Pearl, why does a gambling task actually help to shed light in this instance? Pearl - Previous data suggests that PTSD may be a disorder of disrupted learning. So one of the symptoms of PTSD is hyper-vigilance when you encounter something unexpected. People with PTSD tend to overreact, and a gambling task in the learning context lets us evaluate what parts of learning, what parts of the brain may be disrupted. The way we're able to quantify surprise in the context of a behavioural paradigm is people with and without PTSD are choosing between two stimuli or two ambiguous pictures and trying to learn which one is better and then you see the outcome. And we can infer what your expectations were by how surprised you are by the outcome. Chris - I get it; so essentially you put them in the scanner, you give them a gambling task, and they learn if I do this I win if I don't do that I lose. Then you, what, flip the odds so that then the losing one they don't expect to win they're surprised? Brooks - Every so often they'll get something that they're not expecting. In those cases, we're studying how the brain is responding to those unexpected events. Here in our task, we were trying to figure out whether it's how the brain is responding to those surprises that might be different in PTSD, or whether it's how folks are attending to information once they get that surprise. Chris - And Pearl, do you see a difference, so in the people who have PTSD. Does the brain get more surprised more readily than in people who don't? Chris - And how are you quantifying that? Pearl - So that's what our computational model lets us determine. We have different components of the model that measure how responsive a participant is to surprise, how responsive they are to reward or loss, and how much attention they're paying to the surprise. And in our analyses, we show that it's particularly the attention to surprise that's different in the veterans with PTSD. So everyone shows the same brain response to surprise itself, but it's how much attention you pay to the surprise that extends into choices in the future. Chris - Do you think that that difference was there before they got PTSD and that's why they're prone to getting PTSD or did they develop that as a response to having got PTSD? Brooks- Certainly within this study, we can't examine that prospectively, but it is potentially the case that those who are more predisposed to developing these symptoms of hyper-vigilance might be the ones who are starting off with a predisposition to have this attention modulated learning process. Chris - And Pearl, what are the consequences then of them paying more attention in this way the brain generates a surprise signal, it's generic, everyone has it but then downstream of that you then end up with, in some people some areas of the brain responding a bit too much. Pearl - So one of the potential consequences is that this contributes to learning difficulties that lead people with PTSD to overestimate the likelihood of negative outcomes into the future which then contributes to a hyper-vigilant response. Chris - So does this mean that if a person gets surprised and they then become highly vigilant? Does this transfer to things other than the thing they find traumatic? So will they for instance, if you present them with, I don't know the sequence of cards to remember and you surprise them, will they remember those card sequences much better than someone who doesn't have PTSD? Brooks - That's a good question. We don't know the answer to that, but it could be the case. A negative outcome, a negative event triggers this increase in attention that changes their focus so that they're learning about really any information that's temporally close to that unexpected negative event. So although we didn't test for that in this experiment it certainly could generalize to other information that they're seeing in that same context. Chris - And Pearl does this shed any light on how we can help people with PTSD? Pearl - This work absolutely does contribute to how we might treat or understand PTSD in the future. One of our perspectives is that using these computational models that tease out processes, allow us to characterise mental illnesses like PTSD in the ways that you might characterise some kind of physical conditions. For example, in the case of hypertension, salt, stress, or smoking they all contribute to hypertension. But depending on which contributes the most we might have very, very different treatment strategies. So similarly for PTSD, or post-traumatic stress disorder. Knowing what contributes in a particular case may help us devise different treatment strategies. Could laughing gas prevent PTSD?